We’ll review the various factors that control how the FPB design will keep us out of adverse weather in the first place, the heavy weather tactics at our disposal, and what happens in the event of a worst case scenario. It was not until we were certain that we could design an FPB that would give us at least comparable heavy weather capabilities to our sailing designs that we decided to proceed with this project. The best way to deal with heavy weather is to avoid it. There are two ways to do this. First, no seagoing skill is more important than understanding weather. If you know the basics, keep track of wind direction and speed, log the barometer, and keep an eye on the sky and sea-state, you will do a better job of forecasting what’s coming than a super computer can do locked in a government office thousands of miles away. Most storm systems have a good and bad side. Often moving just 20 or 30 miles can make the difference between an uncomfortable blow and something truly awful. The timing and location are extremely important. The ability to maintain a fast average speed over the bottom, i.e. speed over ground net of current, in unpleasant conditions is a critical component of staying out of trouble. 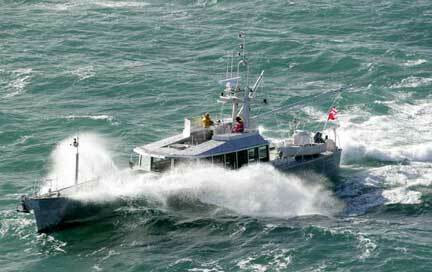 In the photo above, we’re averaging 12+ knots with the FPB 83 into large seas with 32 to 35 knots of wind on the nose. If the need arises, these vessels can be driven through big seas to get them where they need to be. 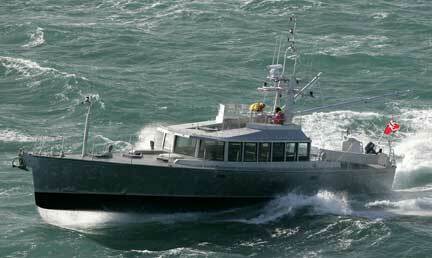 During sea trials the first of the FPB 64s showed the came capabilities, running at nine knots into 15 foot (45m) seas with ease. Speed allows you to get out of the way of weather, move to a favored sector of a storm, or make port ahead of deteriorating conditions. There are two components to boat speed; first, what the boat is capable of doing; second, what the crew can stand. Both of these are related to hull shape and weight distribution. 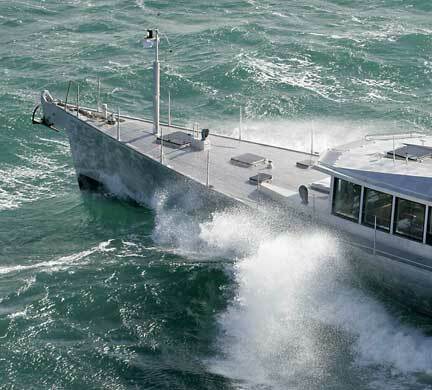 With a hull that gives a relatively soft ride, even in the conditions shown in these photos, both boat and crew can keep going through a wider range of adverse weather. An interior layout that allows you to work and rest close to the motion center of the boat is as important as hull structure in this regard. For everyday cruising, the same characteristics which give the boat good capabilities in conditions we’d rather not be in also make her more comfortable to be aboard in normal conditions. Take a look at our various Passage Reports to see what we mean. Then we get to the hull’s ability to deal with the high impact loads that may be encountered if we’re trying to move the boat against breaking waves at a rapid pace. The Lloyds Special Service Rule (All Oceans) is an excellent start in engineering terms. But in the end, even Lloyds does not contemplate the type of conditions we want to be able to withstand, so we crank up their factors of safety (the subject of structural engineering is covered in more detail in a subsequent article). The photos below give you an idea of what we mean (the first is the FPB 64, the second the FPB 83). We have the structural capability to drive hard into big head seas. We like knowing that we can push just as hard as we can personally stand, without worrying about bending the hull! Put this in the context of a passage from Tonga back to New Zealand – a fairly common trip when cruising in the South Pacific. Assume a southwesterly wind (on the nose and not unusual) for the last half of the trip. The breeze is in the 25-to 30-knot range, average seas at 8 to 12 feet (2.4 to 3.6m), with occasional larger waves from the southwest, with crossing swells from southeast and east. This is a typical washing machine wave effect found in this part of the world. 300 miles from the entrance to the Bay of Islands on the North Island of New Zealand there are signs of a “baroclinic” storm forming to the west. There is a 25% probability that the storm will mature in the next 12 hours and that within 24 hours it will be blowing 50 to 75 knots from a northerly quadrant, making the approach to the Bay of Islands a lee shore. Either we make it to shelter before the storm hits, or we will be forced to heave-to upwind of shelter and ride out the storm at sea. To get to the Bay of Islands ahead of the storm we have to maintain 10 to 11 knot average speed into the steep head seas with which we are presently faced (in these conditions the FPB 64 would be a knot to knot-and-a-half slower). Even with 30 knots of wind and wave drag we’ve got horsepower that will keep us moving. It is what happens when we punch through the waves, many of which will be irregularly shaped, often with square drop-offs on their backs, that concerns us structurally. When this occurs, the G-loadings on the structure are substantial. A boat built to normal all-oceans service under the Lloyds SSC rule would probably suffer some framing and plating deformation – which is why we have much heavier scantlings than the rule calls out. No matter how softly the bow comes down – and it does land gently in relative terms – there will still be substantial forces involved. Of course the ability to maintain speed goes a long way toward staying out of trouble in the first place. In case you are wondering what a “baroclinic storm” can do to the ocean, take a look at the photo at the top of the page. This was taken during the 1994 Queen’s Birthday storm between Tonga and New Zealand. We want the speed and structure to allow us to stay out of these conditions in the first place! Before we proceed it is worth repeating that the same characteristics which serve us so well in heavy weather also make every day ocean voyaging far more pleasant. We know now, after 45,000 miles of sea trials with the FPB 83, that the odds are more in our favor with this design than they were with designs like Deerfoot, Sundeer, or Beowulf. Even so, some of the places we’ll be visiting are going to hit us with severe weather despite our best efforts to the contrary. So we’ve got to think about the handling characteristics necessary to make the best of what mother nature dishes out. This comes under the heading of storm tactics (for a much more detailed explanation of heavy weather tactics in power and sail see our book Surviving the Storm). There is a lot of debate as to what is the best storm tactic. Our own strongly held conviction, based on personal experience and extensive research, is that there is no magic bullet, no single tactic, which is always best. What we want are a variety of tactics that allow us to choose an approach we think is best for any point in a storm – the best tactic will often change as the winds shift and sea-state varies. The point at which our choices of speed and heading begin to be limited is very much a function of steering control. In tropical storms it is often best to run off, away from the center of the storm, with the wind on the quarter (taking the boat away from the storm center – the direction depends on whether this is a Northern or Southern Hemisphere hurricane, and where we are relative to the storm center). At some point it may not be possible to run off at full speed due to breaking seas. The crew is then forced to heave-to facing into the waves, or slow down. Both tactics expose the boat to greater risk from the storm system center – and there may be no choice due to the risks of broaching out of control. When this change in tactics is forced on the crew, it is usually the result of lack of steering control. The better the downwind steering control in normal conditions, the longer we can run off in the breaking seas, and the safer we’ll be in dealing with tropical storms. 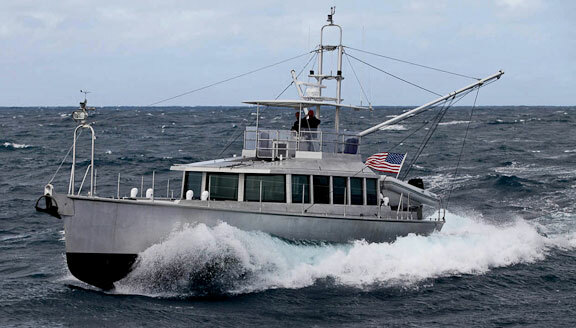 The fact that the bow tends not to dig in at all in most cases (in the photo above the Wind Horse is surfing at 13 to 15.5 knots) means she can continue to run off before big waves until sea room or dangerous breaking seas require that she be hove to. In our trip from New Zealand to Fiji we saw surfing speeds as high as 20 knots on the GPS, all under control of the autopilot, without any tendency to broach. The FPB 64 also shows the same ability downwind, with the bow lifting at higher speeds and good steering control. 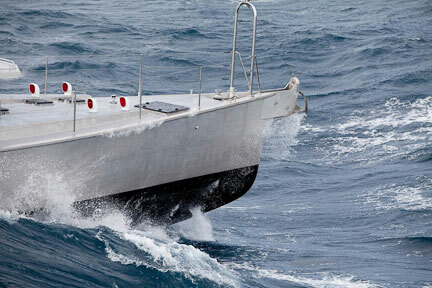 These hull and fin engineering factors also dictate how fast the boat must move to remain under control when it is hove-to, jogging into the seas. The better the slow speed steering control, the slower the boat can be operated. In truly awful conditions – where there are breaking seas from two directions (typically after a frontal passage in storm force winds) active steering may be necessary by one of us to keep the boat headed into the worst of the seas. How effective we are at this, and the reaction time we have to get the boat correctly aligned with a new danger, is directly related to the boat’s maneuverability. In more than 250,000 miles of passaging, we’ve never been forced to use a drogue or para anchor in earnest (although we’ve done some testing). 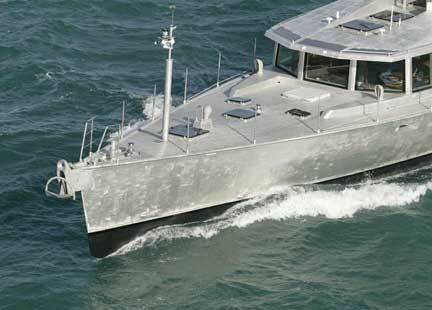 Still, we felt it prudent to design this capability into these boats. In most situations where we can no longer run at speed, we’ll simply head up into the waves and hold station until the weather improves. But the time may come when we are forced to run off in large breaking seas – perhaps we’ve been partially disabled – where we need some form of speed control on the steepest breaking waves. We can foresee two types of drogues being used. In severe but not survival conditions we may want to deploy a simple drogue like the Gale Rider. This will hold the stern more or less into the seas, and allow us to move forward at anywhere from four to eight knots, with control of our direction still under the command of the auto pilot or one of us. The second situation could occur in survival weather – absolute horrendous conditions – with the boat disabled, in which case our choice would be the Jordan Series Drogue. The photo above is of the Jordan Series Drogue. There are multiples of these miniature drogues attached to a long rode. 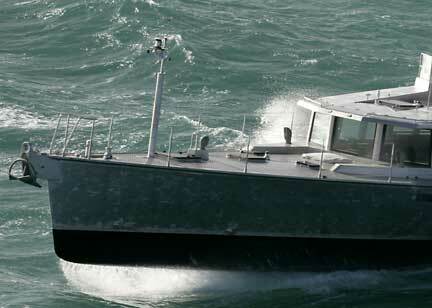 They are very effective at keeping the stern into the waves in extreme conditions. GaleRider and Jordan Series Drogues are streamed off the stern, generate huge loads, and require carefully engineered handling gear to be easily used. 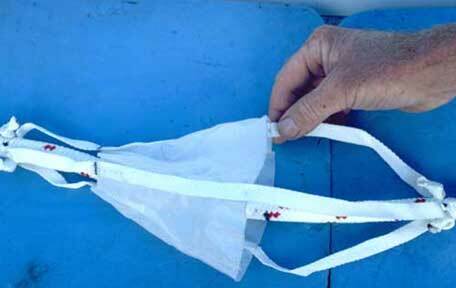 If they are easy to use, we’ll practice with them, and not hesitate to stream or recover them during a storm. The other scenario might occur if we are disabled and wanted to hold station – perhaps we’ve got a lee shore beneath us. In this case we’ll need to deploy a parachute anchor off the bow. These devices used to be commonly employed by commercial fishermen for heaving-to at night or while doing maintenance, and we think it is logical for us to be able to do the same. The loads from a parachute anchor used in survival storms are likely to be higher than what we find from drogues off the stern (we don’t intend to use a para anchor in extreme weather, but we still want the option). The towing bit is designed to carry this load plus a factor of safety. So, if we were ever to deploy the para anchor in survival conditions, its rode would be secured to the towing bit, through the fairlead above the anchor to the right of the photo. After the storm had passed, the rode would be led aft, through the coaming, to the electric winch, to retrieve the parachute. Two important features can be seen in the image above. The first is the towing bit just forward of the windlass. The second is the fairlead at the end of the anchor sprit. 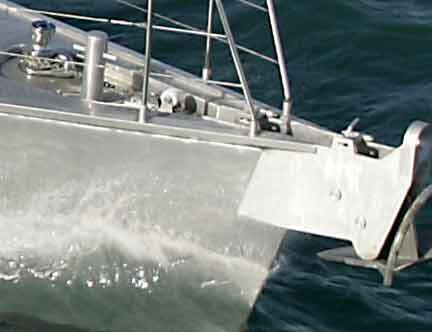 The parachute rode leads to the bit through this fairlead, giving the rode a nice soft edge against which to lie when the bow has blown off to leeward. This shape, in combination with the low stretch characteristics of the high-modulus rode we’ll be using, minimizes chafe. 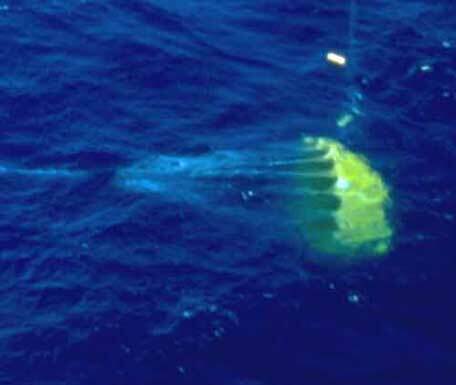 We should point out again that in 250,000 miles of ocean voyaging we have never used drogues or a parachute. Between Beowulf and Sundeer‘s 60,000 miles we hove to once (to prepare a meal) while at sea. So why all the emphasis on preparing for the worst? Because we want to know that the boat will give us the best tools to deal with whatever Mother Nature dishes out. This gives us a sense of confidence and mental comfort that we want to underlie all of our cruising. It also helps that these same characteristics make the boat more comfortable the 99% of the time the weather is benign. This entry was posted on Thursday, January 5th, 2012 at 12:55 pm and is filed under Dashew Offshore, Design Objectives, Favorites. Both comments and pings are currently closed. Why is it that people like Jessica Watson at 17 and Jeanne Socrates at 70 can sail solo, nonstop, around the world, weathering gale after gale, in boats less than 38 feet, while every year there seems to be major calamities that befall boats jumping off for the 1,000 mile dash from Tonga to New Zealand, despite all kinds of careful weather analysis to pick the optimum timing, with bigger crews sailing bigger, faster boats? It comes down to sailing skill, determination, preparation, and design. Bad weather is a relative term. If you are new to the offshore game, then what seems like a survival storm to you is probably a gale to a more experienced cruiser. And the crew has a lot more to do with this than the boat. A good crew can make do with a lot less in terms of factors of safety and equipment than folks without offshore experience. But the yachts come into play as well. If you re going to sea in a high volue, light displacement cruiser, all that interior volume that looks so enticing at the dock makes the boat hard to steer when the breeze is uwhile reducing stability and increasing vulnerability to waves.Long distance voyagers typically are making their passages on more forgiving designs. But that is just our opinion. We bet there are a few others out there. Lets here your point of view. Steve, thanks for the response. I was surprised I got one. But then I know your passionate about what you do. I have recently embarked on a “commuter circumnavigation”, now that I have the time and money. I have no schedule, and plenty of time to select passage windows as I stage the boat around the world in new cruising grounds, and return home to other things. So far just from Southern California down the Pacific Coast of Mexico to the Costa Alegre. I agonized over what boat to take, my 36 year old Esprit 37, or buy a new 57 foot French production design I was in love with. I chartered the 57 and purposely bashed a hundred miles from St Bart’s to Antigua. Whoa. The ride was not appreciably different than what my 37 would have been. I was really confused by that. Loved the idea of a 49′ waterline, but really thought more comfort in a significant seaway with a 50,000 lb boat would come too. Any thought of going forward of the companionway when off watch was laughable. You headed for the immense aft double berth, ignored it, and wedged yourself in with cushions beside it. Another negative was the size of the 57 and its sails. Yes, anyone could single hand it and dock it, as long as conditions were benign and nothing broke. But to my thinking that did not allow any safety margin for my intended purposes of occasional serious short handed distance sailing. I then asked myself if safety and handling are paramount, and I have a boat I really like that I am not intimidated by, and a virtually unlimited budget to prepare it, could I go with with my 37? That’s when I noticed the successes of Jessica and Jeanne in my size boat. Yep, they are sitting ducks on passages with only 5-6 knots to manuver around storms, but when they did get tagged they handled it. It wasn’t pretty sometimes, but they didn’t have to abandon. The other big consideration is that my biggest fear is to put someone else in harm’s way. I only want a couple of experienced crew on passage that lvoe doing it, and know what the risks are. My thinking is with the 3 of us onboard the boat is well staffed. Come what may. Now all I have to do is continue to raise my threshold for what I consider bad weather. So there’s my opinion anyway. Thanks again. I fish out of Washington and frequently go out 50-200+ miles chasing tuna and cross the Columba River Bar (one of the most dangerous bars in the world if not number 1) everytime I do it. I have a 42′ trawler and there have been times I have skied down waves after climbing them, have taken large dangerous breaking waves and twice I have taken rouge waves that were quite frankly very scary. When I was a newbie what I thought was life threatening was in reality a decent fishing day. Is there times I wished I had a 86′ yacht hell yes don’t we all… However the key is having a sea anchor and knowing how to use it, having a well equipment and maintained boat, build your skills over time, watch weather and most importantly try not to put yourself in seas that are dangerous… Could I of avoided most of the most scariest situations I was in by listening to my gut after looking at the weather forecast, yes without doubt.